As the processing power of music production systems is continuously increasing, the digital mixer seems to be less and less frequent in newer studios. It seems that the choice falls between an analogue console or, in lower budget studios, DAW control surfaces. There are multiple reasons for that. One of them is that nowadays you can get a quality eight mic inputs/ eight analogue outputs audio interface for relative cheap and most of them have the possibility to upgrade the number of inputs via a digital connection by using an extra mic preamp module – thus, most users simply don’t need the I/O section or A/D, D/A section of a digital mixer. Another reason is that users can rely on using their Pro Tools system for all the routing and processing a digital mixer does with greater flexibility and power. For all these reasons the DAW control surface is the central hub for a lot of the newer big and small production studios out there. We review the best Pro Tools control surface products to help you make a decision. So what’s the deal with control surfaces and how are they different from a digital or analogue mixer? The main difference is that a control surface does not have any audio, digital or analogue, running through it. It is basically a big mouse with faders, buttons, rotary encoders and in some cases, a transport section. Where a digital or analogue mixer gives the user the possibility to route audio through its channels and busses, a Pro Tools control surface simply acts as a hardware user interface for controlling the faders, pan pots and plug-in parameters. Per short – they do look very similar, having fader controls, rotary encoders and a lot of buttons, but they are very different animals. There are a few different ways in which a controller surface can communicate with a DAW. These communication systems are called digital control protocols and it is important to understand the difference between them. There are three different digital control protocols out there: EUCON, HUI and Mackie Control. Developed by Euphonix and picked up by AVID upon purchase, the EUCON protocol is a high-speed, Ethernet-based communication system that allow DAW’s to connect to AVID and Euphonix controllers and digital consoles. Pro Tools fully supports this protocol. HUI is a control protocol developed by Mackie and Digidesign. It stands for Human User Interface and it was designed as a means for hardware controllers and digital consoles not constructed by AVID, Digidesign or Euphonix to connect to Pro Tools and have some basic control over the DAW. This communication system is not as speedy as EUCON because it is MIDI based rather than Ethernet thus latency may appear as with any MIDI controller or keyboard. Mackie Control is a digital control protocol developed by Mackie and is also MIDI based. The advantage of this control protocol over HUI is that users do not need to manually map physical controls for extended parameter control inside their preferred DAW. The disadvantage? You cannot use this protocol with Pro Tools – hardware that uses this protocol has to run in HUI emulation mode in order to have access to Pro Tools. Sounds complicated? It’s not, really. These digital control protocols are like languages that both the DAW and the control surface have to speak in order to get along with one another. This control surface puts eight high-quality faders, eight knobs, transport controls, and multiple dedicated switches at the tips of your fingers. These provide an amazingly precise control over Pro Tools. 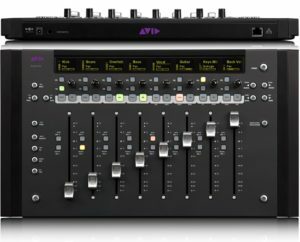 Unsurprisingly, as it is an AVID product, it provides full feature control over the Pro Tools mixer, plug-in selection and plug-in parameters. Its feedback speed is amazing and it is fantastically ergonomic. A big plus is that it has a screen that displays valuable information such as track name, panning, volume, plug-in name or parameter. Considerably cheaper than any Avid control surface the Korg nanoKontrol is a MIDI based controller that can access all the basic functions of Pro Tools. It is a great tool if you are tired of clicking around with your mouse in order to change fader levels, solo, mute, record arm and pan a channel. It is also pretty cool that it has some nifty transport controls. Resolution and feedback are not great but for the price you get a lot of bang for the buck. A big plus is its portability and possibility to use Bluetooth for connecting to iPhones, iPads and Windows devices that have Bluetooth enabled. Price wise, it is in between the above mentioned controllers. It is MIDI based supporting both Mackie Control and HUI protocols. What is special about the X-Touch is the ability to use RTP-MIDI (Real Time Protocol – MIDI). This protocol allows the controller to send MIDI information over Ethernet – this means far better feedback than you get on the nanoKontrol. It has small screens above each “channel” for displaying track names, panning or other information. It also has a transport section with an extra screen for general session information. What’s tricky is that even though for the basic functions, like the ones the nanoKontrol can perform, you do not have to do anything else than plug it in, for all the other features like lug-in parameter controls or modifying screen displays you have to do quite a lot of mapping and it is not particularly simple if you are not a tech wiz. Pros Full control over Pro Tools, very high speed connection, excellent feedback, very comfortable to work with, great transport controls and displays. Above basic control of Pro Tools when fully mapped, great feedback, great transport and displays. Comfortable to work with. Cons All-around great product. No major cons. Small faders and buttons, no visual feedback, not great feedback from the faders, buttons, etc. Difficult to map to Pro Tools for extended features. Whether you are a beginner or a seasoned mixer, being able to control volumes, panning, plug-ins and transport with both hands on a console-like user interface is a great workflow tool. With one of these, the days of writing real time automation with the mouse are definitely over. As with all hardware, I recommend going shopping for the best Pro Tools control surface with a very clear idea of how you are going to use it. Do you really need plug-in parameter controls or are you just buying for basic mixer and transport functions? Whichever you choose it will surely become your main tool for bringing mixes to life.